L. Cristina Griffith is the Assistant Director of the Human Resource Management Division. Mrs. Griffith began her Bureau of Prisons career in 1997 as a Staff Attorney in the Labor Law Branch of the Office of General Counsel in Central Office, after serving as a law clerk to an Associate Judge of the District of Columbia Superior Court. 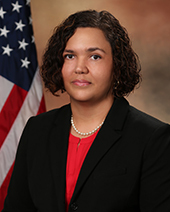 Subsequently, she was selected for positions of increasing responsibility, including Deputy Chief and Chief of the Labor Management Relations Branch, Human Resource Management Division, and Associate General Counsel of the Discrimination Complaints and Ethics Branch, Office of General Counsel, where she served as the Bureau's Ethics Officer. Mrs. Griffith was then selected as the Associate General Counsel of the Labor Law Branch. In 2012, Mrs. Griffith was promoted to the Senior Deputy Assistant Director of the Human Resource Management Division. On December 18, 2017, Director Inch announced he had selected Mrs. Griffith as Assistant Director of the Human Resource Management Division. As Assistant Director, Mrs. Griffith is responsible for the oversight and administration of Human Resource policy and programs that attract, develop, and retain professional and committed Bureau staff. This is accomplished through oversight of the Learning and Career Development Branch, Staff Training Academy, Management and Specialty Training Center, Human Resource Services Center, Labor Relations Office, Personnel Director's Branch, and the regional administration of Human Resource Management. Mrs. Griffith studied Political Science at Duke University and received her Juris Doctor degree from George Washington University Law School in 1994. Mrs. Griffith received the 2003 Assistant Director's Award for the Human Resource Management Division. Mrs. Griffith has been a member of the Senior Executive Service since 2012.